Dermoid Cysts - Tick bite, or Tumor? 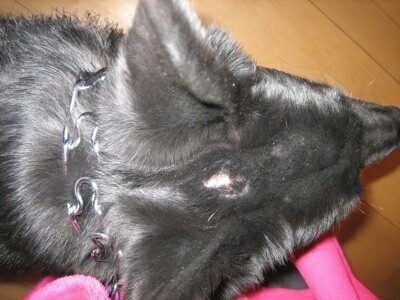 A few months ago I pulled about four ticks off the top of my Shiloh Shepherd's head. I noticed that there were hard lumps, about the size of a pea, left where the tick had been embedded. I applied antibiotic ointment to the lumps for several days and waited for them to shrink or disappear. Neither happened. In fact, the lumps seemed to get bigger at first. 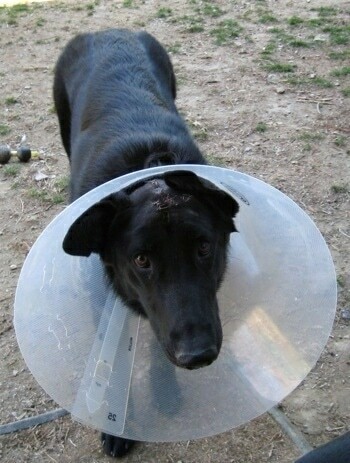 I decided to just leave them alone for a while thinking that maybe the ointment was actually aggravating the “bites.” My eight-month-old puppy was behaving normally, like a burst of hyper energy typical for her age. So, letting time heal the wounds did not worry me in the least. However, after several weeks passed, the lumps were now growing out of control. I figured something was definitely wrong. I took her to the vet and he said he had never seen anything like it before. He referred me to a veterinarian whose specialty was dermatology. By this time, the lumps had grown to about the size of a walnut. Some of the hair on the lumps was falling out as well. When the dermatologist looked at the lumps he told me that they looked like some kind of a tumor and that it had nothing to do with the tick bites at all. He said it was just a coincidence and that the tumors would have appeared with or without the ticks; they were unrelated entirely. Well, that was quite a shock to me, needless to say. 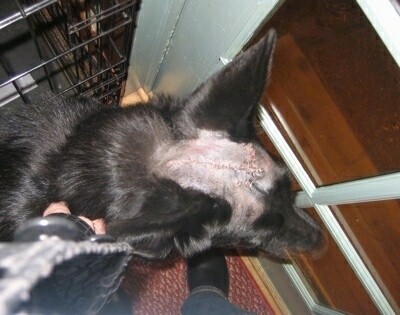 So now the thing to do would be to take a biopsy and determine what kind of tumor my puppy had. 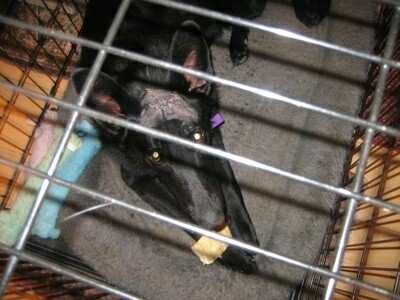 He thought it was strange that such a young dog could have tumors at all. But, when we got the results of the biopsy, it was clear why. 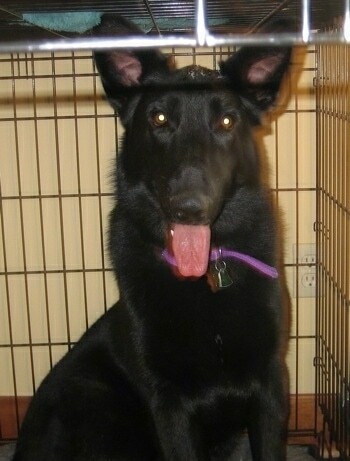 Shadow, my puppy, had what is called dermoid cysts. These are a type of cystic teratoma. When I found out what a teratoma was, I was floored. It is one of the most freaky medical things I have ever learned about. A teratoma is a neoplasm, which means new cells formed, or in this particular case, a tumor. Teratoma, a Greek word, translates to mean “monstrous tumor.” A teratoma means a tumor with tissue or organ materials, resembling normal tissue, but the tissue is different from that which surrounds it. It can be completely misplaced tissue, often quite grotesque, and in the wrong spot. In other words, her tumors could have been normal tissue but that of a liver, or even more freaky, teeth, or bone, eyeballs, torso, hair, or hands (in a human). A dermoid cyst appears most commonly in the ovaries or the skin. They are mostly benign which I was relieved to hear. These tumors are more or less a birth defect, since they were developed in the womb. That is why such a young puppy was able to have them. 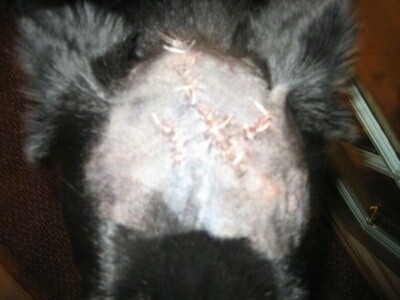 When my regular vet did the biopsy, we decided to remove all of the lumps completely. Since she had about five lumps, some larger than others, there was a lot of cutting to be performed. My vet told me that after he shaved her head pre-operation, he learned that the biggest tumor, the walnut-sized one, was actually much bigger than the lump made it appear; it went across the entire length of her head, about 6-7 inches long. When I retrieved Shadow at the end of the day, I was greeted by a dog that looked like Frankenstein. 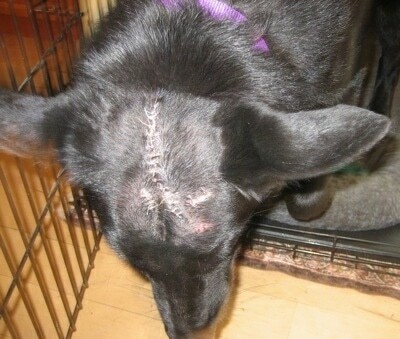 She was all skin and stitches (on her head). At about three months since the first tick bite appeared there were small lumps caused by the ticks, but then the tumors grew right afterwards, so it is easy to see why I thought the lumps were some sort of tick-related infection. Either way, I am so thankful to the two vets for solving this mystery for me. 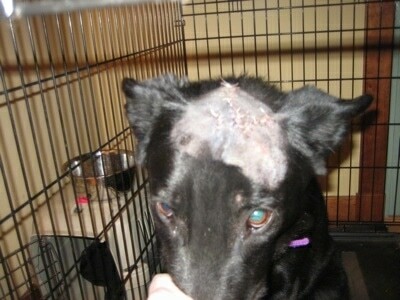 Fourteen days after the surgery to remove the tumors, she went in to get her sutures removed. Her hair was growing back nicely, but there was still one spot left on her head that is red and where the hair hadn’t grown back yet. Not sure yet what that is. If it turns out to be another tumor that was missed because it just started to appear after the shaving took place, I’ll write about that as a part two to this story. FYI, I thought I should mention a little drama that took place during the healing process. 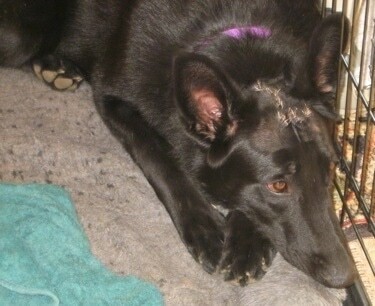 About one week after her surgery, Shadow’s head began to itch. Needless to say, she found a way to scratch it, busting some of the stitches towards the back of her head, thus opening the incision about one inch in length. I had to take her to the emergency clinic on Easter morning when I was expecting 35 guests to arrive that afternoon. 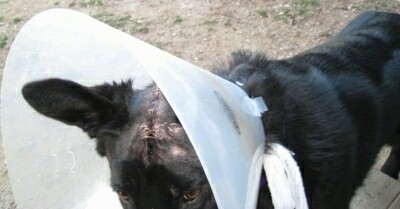 They put two staples in her and gave her a “lamp shade” collar. 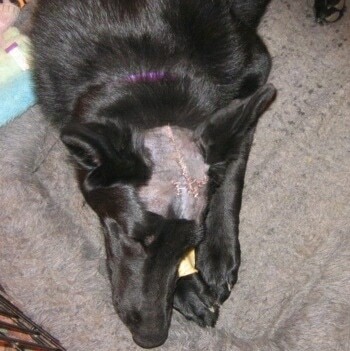 The incision has remained sealed up and has continued to heal nicely. Unfortunately, the collar has caused a bit of damage to my walls and furniture since Shadow keeps bumping into them with the sharp edges. Finally I duct-taped the entire circumference of the collar and the problem was solved. If you ever have that problem with those collars, give it a try. 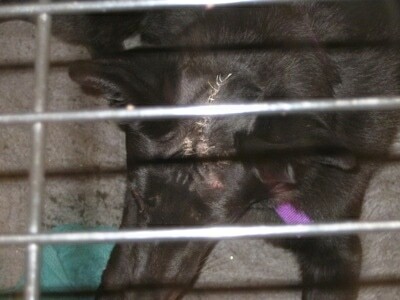 This is what Shadow looked right before the sutures were removed. 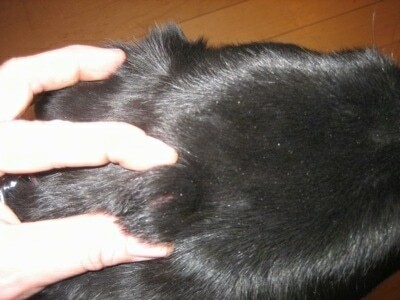 If you look here, you can see an area where the hair is not growing back very well, and it’s also a little pink (lower right side of photo, lower left side of her head). This is the area I am concerned about perhaps being another tumor that simply sprouted up later than the others. It’s terrible that these tumors chose her head to develop on, but it’s certainly better than having them spread throughout her entire body. The next vet visit will tell more about the suspicious, remaining pink area. Shadow remains a beautiful and well-loved puppy today and always. Frankenstein or not.